Urban mobility is a very complex system that often responds in unexpected ways. It appears that whatever we do to tackle congestion results in a partial solution that seems to generate its own problems later. We eliminate a bottleneck here and the queues are transferred to another location. We improve roads and the cars immediately use the new capacity with traffic returning to its original congested condition. We improve public transport and few drivers switch mode. Transport projects and policy interventions seem to generate unexpected consequences more often than any other system, thus frustrating the transport planners and decision makers and nullifying their efforts. The best practice in addressing these issues is to develop and use an analytical model of the transport system of interest. This is the best way to consider simultaneously most of the impacts that a potential project may generate. There is plenty of technical literature on the practice of developing good transport analytical models including the book, ?Modelling Transport?, co-authored by this author with Prof. Ort?zar. Different levels of detail can be applied in transport modelling. 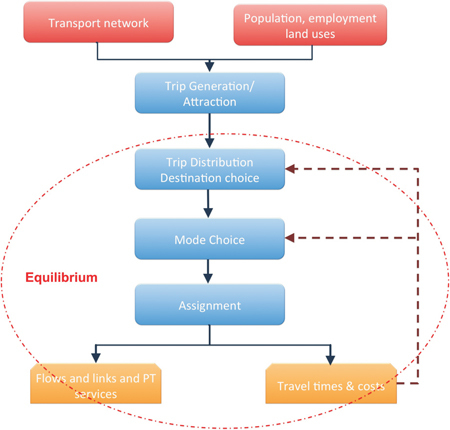 These range from modelling trips between zones (Classic Aggregate Modelling) to identifying representative individuals trying to replicate their travel choices (Discrete Choice Modelling) or activities during a week (Activity Based Modelling). The choice depends mostly on the availability of data and the capacity to forecast at the chosen level of detail and the allocation of individuals or groups to different locations in space. The two main inputs to the model are the transport networks and data on where people live, work and study, and where economic activity, hospitals and commercial centres are located. To represent the location of these activities in space, it is customary to divide the study area into zones, typically between 500 to 2000 for a city or region of over one million people. These zones are usually based on census tracts as this facilitates the analysis and projections for the future. The network is represented by links, each with its own characteristics like length, capacity, free-flow speed and an analytical relationship that shows how travel times increase when flows increase, i.e., the effect of congestion. Note that this function allows the demand to exceed capacity for a short period of time; there is an analytical requirement for this. Note also that a public transport network is generally more complex as one needs to specify the location of stops/stations, the frequency of service (buses/hr) and the capacity of the units (passengers/bus); one should also specify opportunities to transfer from one service to another and detail on how long would all walking times be. Information on the network and the characteristics of each zone are then fed onto Trip Generation and Attraction sub-models. These can be household or zone-based for trip generation whilst for trip attraction the sub-models are generally zone-based only. Regression or Cross Classification models are usually employed at this stage. The output from this sub-model is the number of trips generated and attracted by each zone. The number of trips between zones i and j is proportional (k) to the product of the trips generated by zone i and the trips attracted by zone j divided by the cost of travelling between i and j to the power of n. In the original gravity, model n=2 but in transport, this depends on the city in question and values between 1 and 3 are often found. In practice, more complex models are used here but they can generally be interpreted as related to the gravity model. The greater the distance between two zones, the less likely it is to have trips between them. The greater the production and attraction of two zones, the more likely the probability of trips between them. The output from this sub-model is a matrix of trips between each Origin Destination pair. For a study area with 1000 zones, this is a trip matrix with 10,00,000 cells, each with some trips. In fact, in most cases there will be more than one such matrix as they will be generated by trip purpose: Home Based Work, Home Based Study, Non Home Based Work, etc.